The steering-wheel moved forward during the impact to provide greater protection for the driver. The driver dummy scored maximum points in the test but the car lost points because of some stiff structures in the dashboard which might affect the knees or femurs of larger or smaller occupants. The car scored maximum points based on the dummy results in the side impact. However, the head curtain airbag was prevented from deploying fully by the child restraint system in the rear seat and the score for the driver's head was penliased as a result. In the side pole test, dummy readings of rib deflection indicated marginal chest protection. The front seats and head restraints provided good protection against whiplash injury in the event of a rear-end collision. The C30 scored maximum points for its protection of the 1½ year old in the dynamic tests. The passenger airbag can be disconnected by Volvo dealers, allowing a rearward-facing child restraint to be used in that seating position. Volvo also offer an airbag deactivation switch as an option. However, the switch system does not provide clear information to the driver regarding the status of the passenger airbag. The presence of ISOFIX and top-tether anchorages was not clearly marked. The leading edge of the bonnet scored no points for the protection it offered to pedestrians' legs and the bonnet was predominantly rated as poor for the protection of adults' heads. However, the protection offered by the bumper was predominantly rated 'fair'. Electronic Stability Control is standard equipment across the model range, as is a seatbelt reminder system for the driver and front passenger seats. 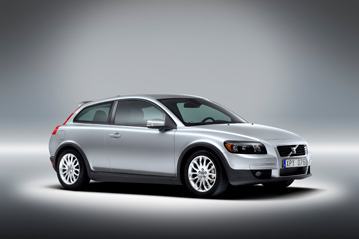 The Volvo C30 was originally assessed by Euro NCAP in 2007. Whiplash tests have been done to supplement the original test data, and a rating has been calculated according to the new requirements of 2009. There is no change to specification of the car or its safety equipment from the one tested in 2007.